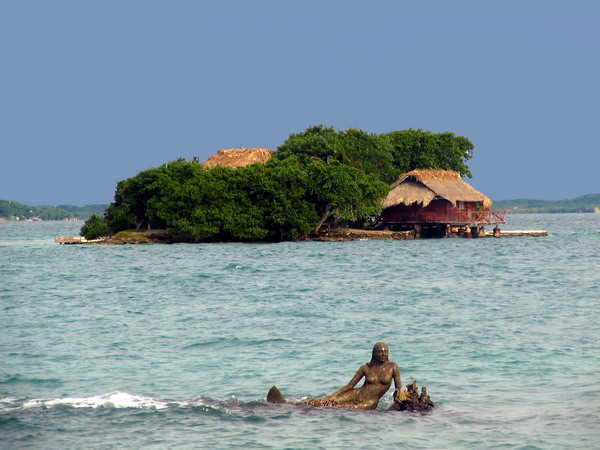 Isla del Pirata is a tiny islet, one of thirty islands in the Archipelago del Rosario just a few miles southwest of Cartagena / Colombia. 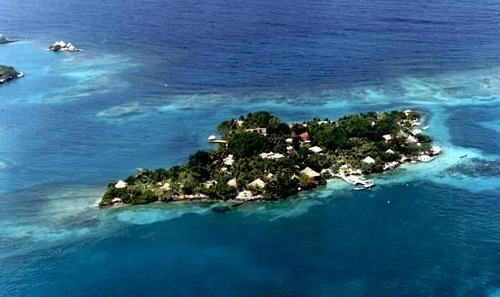 It is private property and the owner runs a hotel which consists of 12 bungalows.The dimension of the island - shown above - is only 21.000 sq feet (2300 m2). We were very curious how vacation is on such a small island! I was sure that it won’t be boring for me with my radio in front of me but for my XYL ...??? We knew that we surely would find some things to do besides hamradio. And there are a few other islands nearby. We start our tour to Isla del Pirata from Cartagena’s Muelle Turistica at 9:30 in the morning. With the speedboat it takes about an hour. 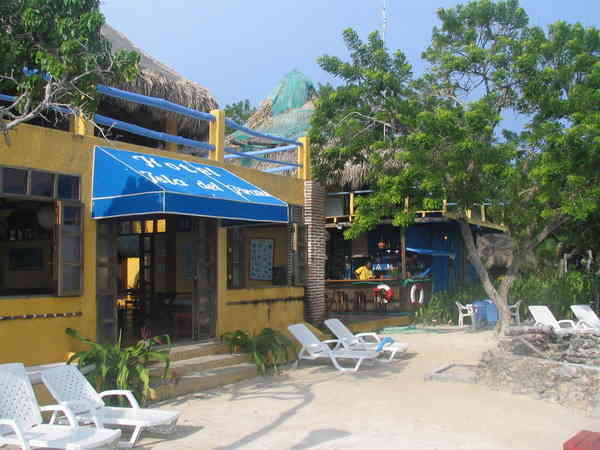 We pass La Boca Grande, the tourism mile with many restaurants and skyscraper hotels on a narrow peninsula, the Cartagena lighthouse, the Fort San Fernando de Bocachica and leave Isla Barú on the left. After a while some small islets appear in front of a larger island. One of them is Isla del Pirata, the big one Isla Grande. 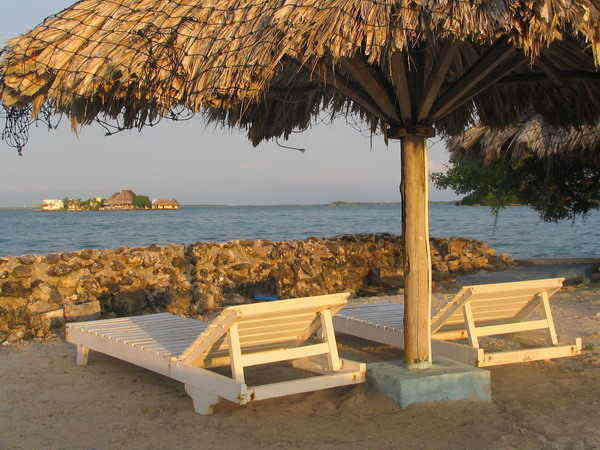 We disembark and enter the island, occupy our cottage and go on a first discovering tour. It doesn’t take more than about 5-10 minutes to surround the small island. The first night we are the only guests. I get the first shock, when I open my antenna case. A custom officer probably forgot to insert a few parts of my Butternut HF9VX after checking the content. I miss the 30m coil support tube, the 6m- and 15m-wire-extension and a few clamps. I “sacrifice” the aluminum strip of the 12m-coil-combination and tinker a few clips for the 15m-wire-extension and the 30m-coil. Not easy without the right tools. After a while most bands work. With a few hours delay I am QRV as HKØGU/1. It doesn’t take long and I have a nice little pileup on 40m. After 8 hours I log QSO Number 710. Because one bad luck is not enough, the frame of my glasses breaks in the middle as I clean them the next morning. And of course I don’t have any backup eyeglasses. Titanium is hard to solder so I wrap the two frame parts with wire and solder them - ready are the designer eyeglasses. “Murphy” still stays by my side for another while. I take part in the WAE RTTY contest - or should I better say - try to take part. The contest starts on Friday evening local time and there are several strong signals on the bands but I can’t reach anybody. I have 8 QSOs in my log after an hour but I don’t want to give up. After more than 8 hours and only 69 QSOs I loose my nerves and surrender the condx. I change to CW on 40m and run again a huge pileup until 13.00z. It is hard to filter the call signs out of the big “noise”. 40m is the best band and I manage 2533 QSOs on that band, more than 70 percent of all Q’s. Sometimes I try SSB but the only one who hears me is Pedro, HK3JJH, when I call a 9A-station for a while without success. And with him I had the only SSB contact at all. I didn’t want to disturb the other guests with my voice during the nights. Now we know what vacation on such a tiny islet means. We never got bored. Neither I in front of my radio nor my XYL Erika. She found a lot to watch under water though the reefs are not even breathtaking. 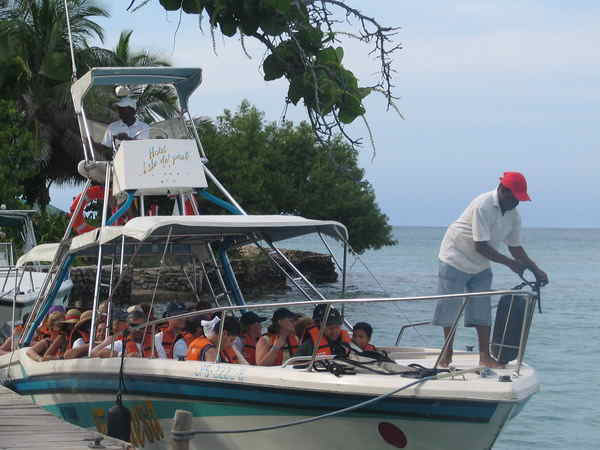 Due to heavy boat traffic between Cartagena and the islands as well as the global warmth the coral reefs are rather destroyed around Isla Pirata. A bit farther out in front of Isla Grande there are some nice reefs with quite a few fish. 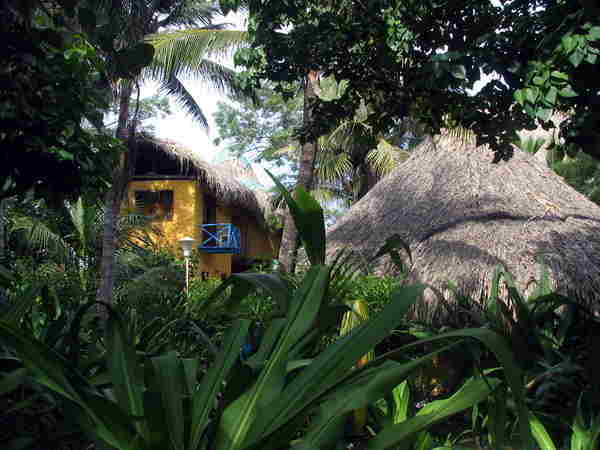 We enjoyed the tranquility and the good service. The staff was very kind and friendly and helped whenever we needed any assistance. 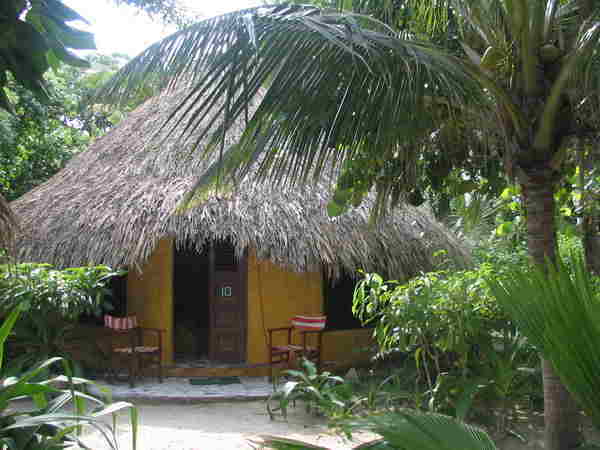 To find more info about Isla Pirata click here.